Tuba, a beverage made from the sap of the coconut palm tree, is commonly served in the muggy, tropical heat of Colima, Mexico’s city of palms. Locals ferment tuba to make fruity coconut vinegar, which they use to braise pork. Enter the state’s famous tatemado de Colima, which is so good that it just might dethrone your love for carnitas. The vinegar, chiles, and garlic cut through the richness of the pork for a super-tender result. This version from Javier Cabral and Paola Briseño González makes an excellent special-occasion dish for a big group and, like many other Mexican braises, tastes even better the next day. Place pork shoulder on a cutting board; using a sharp knife, score pork at 1-inch intervals. Place in a large, deep baking dish. Combine coconut vinegar, garlic, 2 tablespoons salt, and black pepper in a blender. Process until smooth, about 30 seconds. Pour marinade over pork; cover and refrigerate 3 hours or up to overnight, turning once halfway through marinating. Preheat oven to 325°F. Place guajillo chiles and 4 cups water in a small saucepan. Bring to a simmer over medium. Reduce heat to medium-low, and cook until chiles are tender, about 15 minutes. Drain chiles. Remove pork from marinade; set aside. Place marinade, chiles, ginger, tomato paste, coriander, cumin, sugar, bay leaves, and remaining 2 cups water in a blender. Process until smooth, about 60 seconds. Pour mixture through a fine wire-mesh strainer into a bowl, pressing to extract all liquid; discard solids. Sprinkle pork with remaining 1 tablespoon salt, and place in an ovenproof Dutch oven. Pour chile mixture over pork; cover and roast in preheated oven until pork is tender and falling apart, about 4 hours. Remove from oven and uncover. (Cooking liquid should be the consistency of heavy cream. If too thick or scorching on the sides, add up to 1/2 cup water.) Increase oven temperature to broil on high with oven rack 12 inches from heat. Return pork to oven, and broil until pork is lightly browned on top, 5 to 10 minutes. Remove pork from oven, and let stand until cool enough to handle, about 10 minutes. Remove meat from bone, and place in a large bowl. (If sauce isn’t thick enough, cook sauce over medium-high until thickened and slightly reduced to about 1 3/4 cups. Let stand 5 minutes.) Skim off and discard any fat from sauce. Pour 1 1/4 cups sauce over pork, and gently toss. Reserve remaining sauce. Place about 1/3 cup pork on each tortilla, and top evenly with cabbage and radishes. Divide reserved sauce evenly among tortillas. 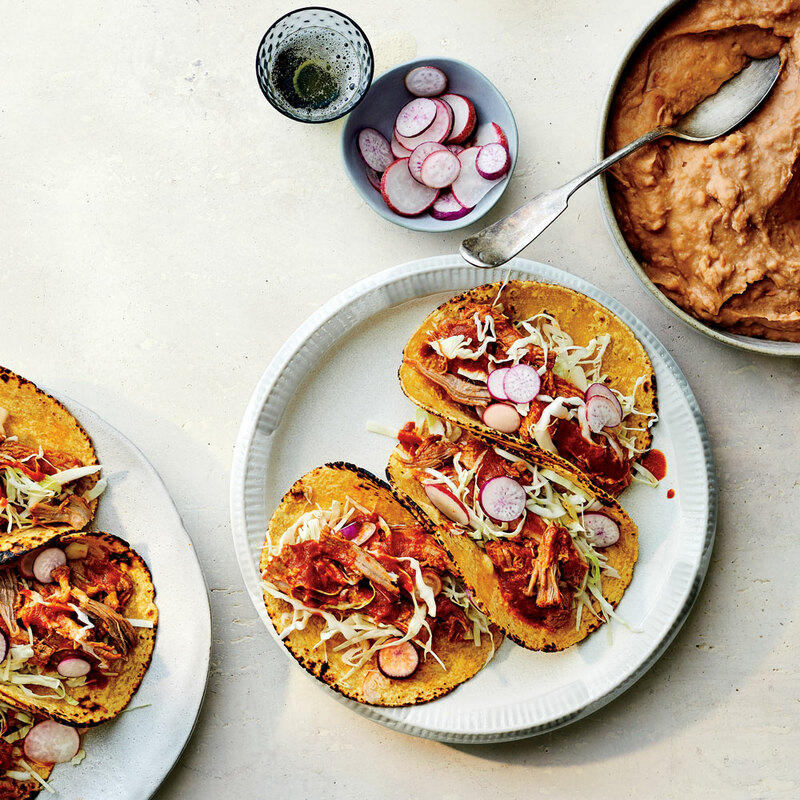 Serve with refried beans.